Internal communications can make or break a company’s culture, whether the materials are aimed at a handful of people or a global staff of hundreds. Here we share 5 creative ideas for improving your internal communications materials to increase effectiveness and encourage employee engagement. When asking employees to adjust their behaviour or adopt a new company policy, it’s essential that your internal communications messages are clear, memorable and approached in an interesting way. Cost-saving initiatives are among the most challenging topics to communicate to employees, and traditionally result in the lowest levels of adoption and engagement. One of the best ways to offset this is to include something that makes your communication stand out, like an animated video, so that staff actively take a moment to focus on and absorb the information fully. In a survey of internal comms professionals, 53.6% agreed that employees now expect to see video internally because of wide use externally as consumers, whilst an overwhelming 92.4% agreed that visual communications are becoming a more important part of internal communications. By communicating with employees in a way that they’re familiar with and prefer, you automatically make your internal communications materials more memorable and begin to see increased engagement. For example, we recently created a video animation for a long-standing client to ask nearly 60,000 of their employees worldwide to think twice before they booked corporate travel. Although the policy had been communicated via other forms in the past, an animated video helped capture employee attention right from the start because it was novel and unexpected. Using a more infographic design style to communicate simple key messages made it easier to understand the problem, and how staff could actively participate in helping to solve it. 2 – How about embracing a non-traditional approach? Sometimes, even positive messages that significantly benefit your employees can be difficult to communicate – especially in large organisations. Although employee benefits play a vital role in attracting, engaging and retaining staff, the sheer volume of information can be difficult to identify, sort through and absorb. Many companies turn to an employee handbook or intranet, however, this may not always be the best solution for a workforce that isn’t based in an office. By taking a close look at how and when employees are best able to absorb information about benefits, we were able to come up with a new approach for Hilton Hotels that was both memorable and effective. 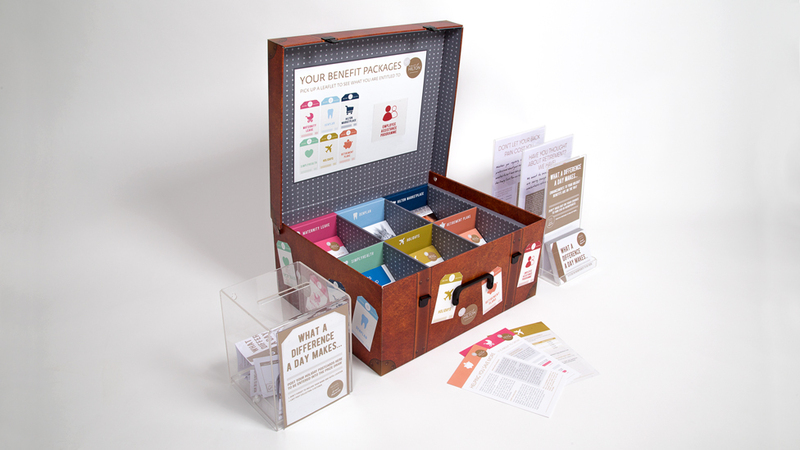 We asked employees “What would you do with an extra day of holiday?” – a new benefit being introduced – and re-designed the company’s traditional internal communications materials to look like a suitcase with colour-coded airline tags. Placed in busy staff areas, the case was hard to resist, and made it easy for employees to learn about new and existing benefits that were relevant and easy to update. A very impactful way to encourage employee engagement can simply be to re-think your workspace and surround your teams with tangible representations of the company culture you’d like to create. For example, if your company is rooted in innovation and creativity, the space your staff work in has to inspire this ethos to make it easier to generate new ideas and productively think outside the box. This is exactly the environment that one of our clients wanted to create for their new headquarters. Named ‘Cloud 9’, the new office needed to be inspiring, unique, and help the company recruit the kind of employees that would ‘Think Big’ and push this young, nimble company to the next level in the HR software field. Our experiential design team drew inspiration from Jack and the Beanstalk to change the office environment into a land of the giants up in the clouds. This inspirational office design included cloud signage, oversized furniture in the shape of boulders, wall vinyls with winding vines and a collaborative garden, complete with AstroTurf, where creative thinkers could engage. While there are many advantages to working for a global multinational organisation, there are also some challenges – especially when communicating data, achievements and the value that an internal department may deliver to the company as a whole. Cultural differences, the geographic spread of employees across different sites and even how teams work at each location can make distributing large quantities of information difficult in internal communications materials. However, sometimes the problem is also the solution – as with the strategically-placed infographic we designed for the IT department of a major financial firm. 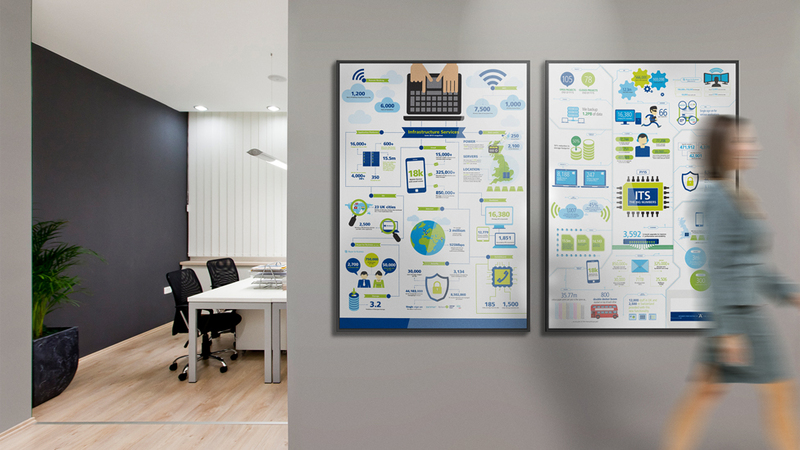 By rearranging large quantities of key data into two colourful and fun infographic posters, we were able to effectively communicate how efficient and vital the IT team was to the company’s overall operations. In addition, the design also helped staff understand what key areas the IT team were responsible for and fostered increased understanding and appreciation between colleagues in different areas. High quality employees are an asset to any company, which is why attracting and engaging them is so important. It’s also key to focus on staff retention. Employees that are engaged and motivated are more productive, and not only will they act as powerful ambassadors of the company’s brand and products, they’ll want to stay. That’s why it’s important to treat internal communications materials with as much care and consideration as those that would target customers. This includes being sure materials are adequately proofed and providing ways for staff to clarify information and provide feedback. When rolling out a new company-wide initiative, employee buy-in and support becomes especially important. Changing systems and ways of working are usually very costly, so it’s essential that new practices are learned and implemented as quickly as possible. 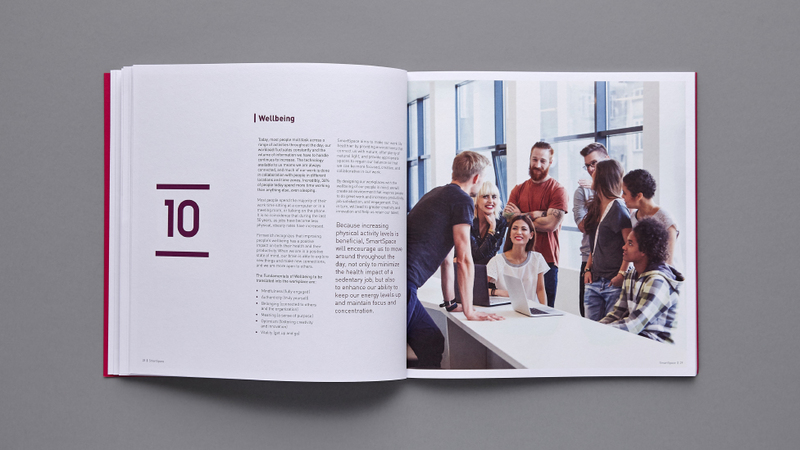 To ensure the rapid adoption of their new SmartSpace concept – which promoted new inspirational workspaces throughout the company – we helped our client develop a premium employee brochure as the cornerstone of their internal communications strategy. Created to share the company’s vision with all their offices worldwide, this communication was more than just a brochure – it was a brand book and guide that educated employees about the new workspaces and empowered them to make the company’s new way of working a success. For more ideas on how to improve you internal communications and employee engagement materials, have a look here.